Ever since Maria Grazia Chiuri took over Dior, I fell in love with the pieces from their new collection(s). As you probably know, by the beginning of this year I didn't have any Dior bags or shoes in my collection. 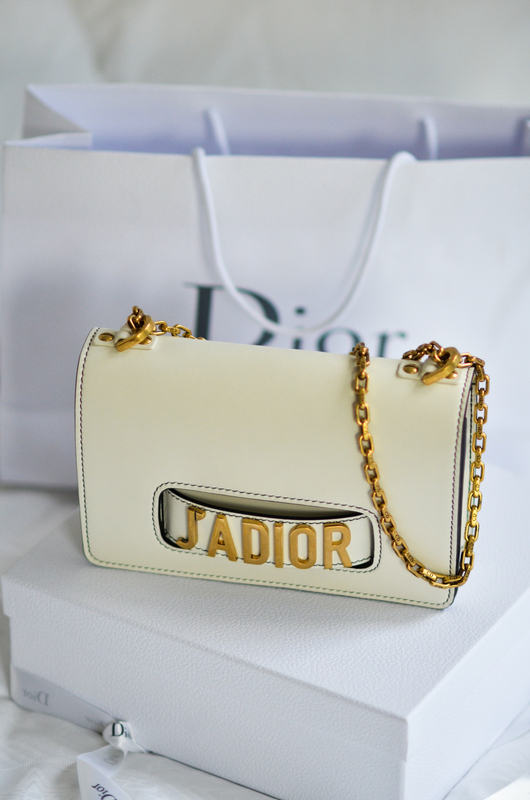 In February I decided to purchase my studded Lady Dior, later on I bought my Diorama and now I decided to buy another bag by Dior and make my bag collection even bigger - I decided to go for the J'Adior bag/clutch in off-white. Now I know that many of you won't find this bag attractive or might think it's too "showy", however I really love this piece and I think it will be perfect not only for summer, but also for fall and winter! Od té doby co se stala Maria Grazia Chiuri novou kreatovní ředitelkou Diora, značku jsem si oblíbila a opravdu se mi stylem přiblížila. Začátkem roku jsem neměla ještě ani jednu kabelku, ani boty od Diora ve své sbírce a teď mám ve své kolekci již 2 páry bot a 3 kabelky. Mým posledním úlovkem byla tahle "J'Adior" kabelka v "off-white". Vím, že několika z Vás se asi líbit nebude a může Vám připadat "moc křicící". Mně osobně se ale kabelka opravdu líbí, mám z ní radost a už se nemůžu dočkat až si jí vezmu na sebe. As you might know, this bag comes only in this size - and that is medium. 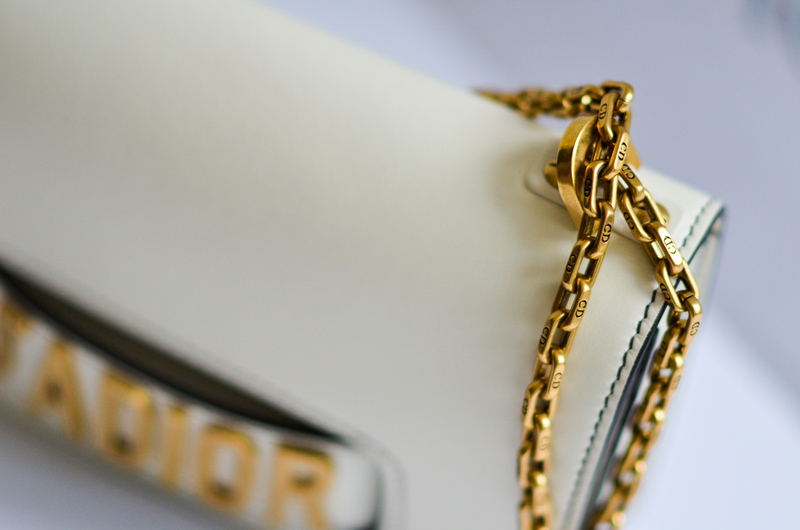 You can choose between a golden version with a chain or a silver version with a leather shoulder strap. 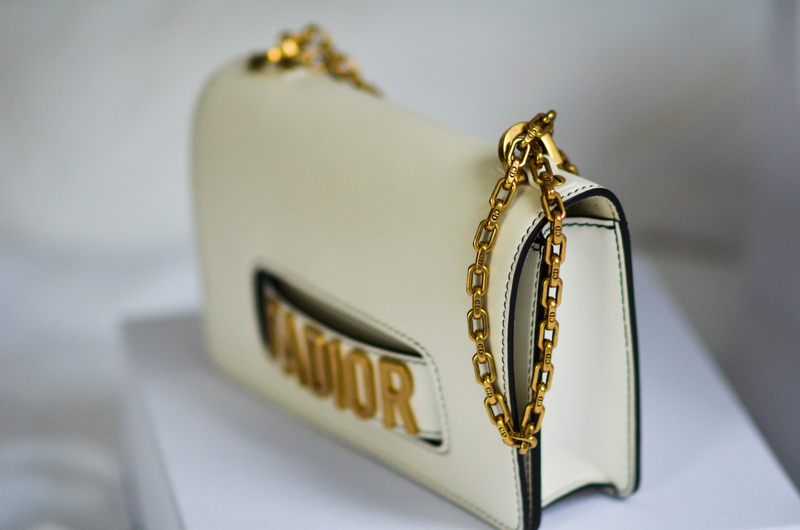 As I was looking for a white bag with golden details, my choice was more than clear. In general I also like this version more than the one with the strap, which looks - in my opinion - too "masculine". Inside you'll find several pockets, which fit everything you'll need during the day - phone, wallet, keys, lipstick, sunglasses and smaller accessories fit into the bag perfectly. The bag is a part of the new Dior's collection and for me this is a piece I consider a "new classic". What I really like about the bag is that you can wear it on the shoulder, but also as a clutch, which will be perfect for evening events as well! When I was buying the bag, the only thing that was holding me back was a big question I was asking myself: is this just a seasonal piece or is this going to be the "new" classic of Dior? I have to say that this bag was stuck in my head for a long time - I even tried it once in Prague and I still couldn't get it out of my head. Since my exams are over now and I had a stressful period in my life, meaning managing my work, my school and cleaning out my apartment, I decided to treat myself a little bit before we leave to our vacation. I think the bag looks great and I think it will also hold its value. Jediná věc, která mě od nákupu odrazovala, byla otázka zda-li se jedná o sezónní kousek a nebo "novou" klasiku Diora. Na kabelku jsem ale myslela již pár měsíců, jednou jsem si jí dokonce už zkoušela v pražském butiku a tak jsem se rozhodla sama sebe odměnit za zvládnutí zkoušek, odstěhování se z Drážďan a práce zároveň. As I didn't have any white/golden bag in my closet, my choice was clear - even though I have to say that I really their burgundy version as well. For me this option will be perfect all year long - if I would have bought the burgundy one, it would be more a winter bag. 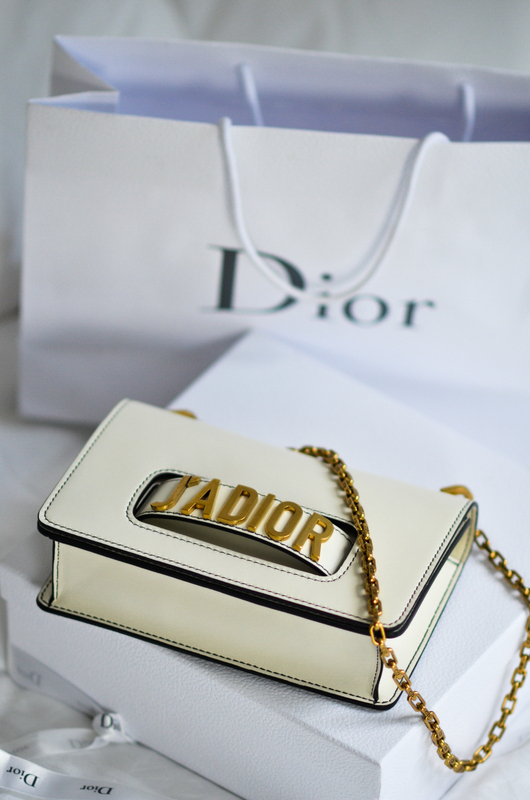 I know that buying a white designer bag is always a risk - however Dior has an amazing team, which can take care of your bag and make it look like new again. That was another reason I wasn't holding myself back from this purchase. So how do you like my new bag? Tak jak se Vám kabelka líbí? 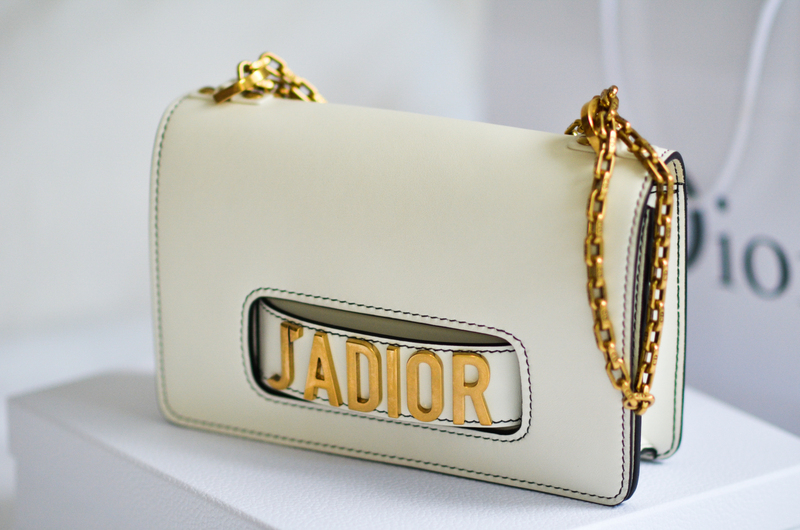 I love the "J'adior" - such a cute little twist! 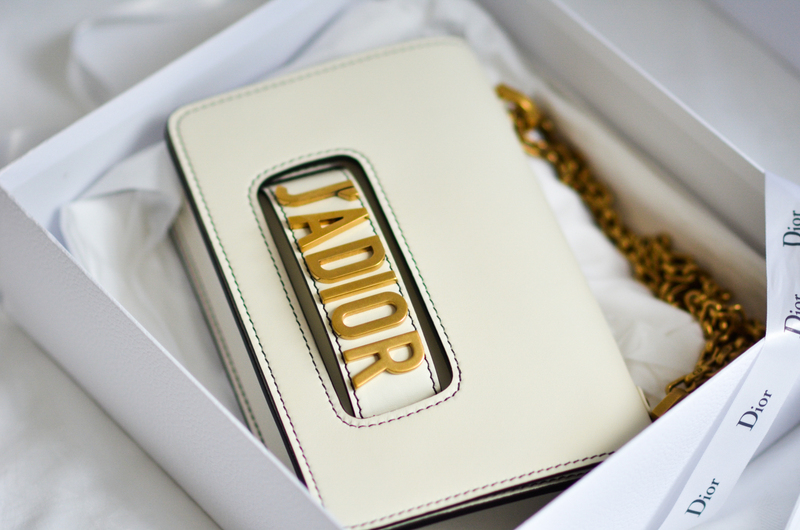 I'd say it\s a perfect white bag! It's such a beautiful bag! So perfect for summer with a cute dress or pastel outfits. Kabelka je opravdu moc krásná..